High impact, low maintenance. Fiber cement siding is available in different styles and with a range of factory-applied finishes. It provides the fine appearance of traditional wood siding, with none of wood's durability and maintenance limitations. Photo © 2015 James Hardie Building Products, Inc. All rights reserved. Does your home need new siding and exterior trim? These highly visible exterior details have a huge impact on any home’s curb appeal. If your home exterior is looking tired and worn, there’s good news. Installing new fiber cement siding and compatible trim will give your home a new look that radiates craftsmanship and high quality. More good news: Fiber cement siding can duplicate the appearance of traditional wood siding styles, but it won’t be damaged by fire, insects or mold. Nor will it require frequent painting like wood siding usually does. Dimensional stability is another important difference; fiber cement doesn’t warp, split or curl with age and exposure to the elements. Fiber cement is manufactured by adding water to a mixture of fine sand, Portland cement and wood fiber. The resulting “slurry” is then formed into panel and siding products. When the mixture hardens and receives a multi-coat finish, you have exterior siding with the durability and dimensional stability of masonry but the workability and appearance of wood. You can choose from a variety of siding types to suit your home style or personal taste. It’s available with a smooth finish or with a convincing woodgrain surface texture. Fiber cement won’t burn, rot, cup, crack or attract mold like wood siding can. No painting is necessary. Choose from a wide range of super-durable, factory-applied finishes. It’s extremely durable and resistant to impact damage. Fiber cement is impenetrable to termites and carpenter ants. Fiber cement corner boards, soffits, and other exterior trim components are available as part of a complete exterior makeover package. Industry-leading James Hardie fiber cement siding comes with a 50-year warranty. Contact the siding experts at Christian Brothers to learn more about beautiful, durable, low-maintenance fiber cement siding for your home. 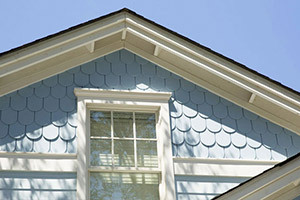 When you install this distinctive siding, your only regret will be that you didn’t do it sooner. We do vinyl siding too! Vinyl siding offers some of the same advantages as fiber cement siding: low maintenance (no painting required), resistance to rot & insect damage and a variety of style & color choices. If you want new vinyl siding installed by our expert crew for a very affordable price, contact us right away.